Entrants and watch dog members of the Good Sam Club (keeping things honest) getting ready. Waking up to the early morning haze in the High Sierras, 6500 ft above sea level. 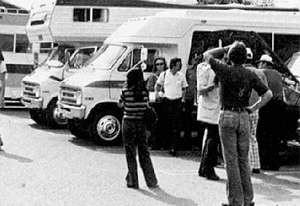 In the late seventies Russ ran a fuel economy run to find out how various RVs fared under a variety of conditions. The run consisted of 40-50 RVs driven caravan style over three days and 339 miles to determine fuel economy for each of these rigs. The run would start out in Irvine and drive up to Pismo Beach, where participants would stay the night after a big group Bar-B-Que on the beach. The next day everybody would head into the interior of California, through Visalia, and into Kings Canyon National Park in the High Sierra. There we would have another party and spend another night, and then venture back down the mountains into the central valley of California, up the Grapevine over the Tehachapi Mountains and back to Irvine, Ca. One of the surprising things that Russ discovered was that the longer version of an RV often got better mileage than the shorter version of the same brand. This was a little perplexing, so Russ asked a friend who worked for Douglas Aircraft if this made sense in an engineering way. "Absolutely" said his friend. " Have you ever heard of the Cutty Sark?" "Isn't that some kind of whiskey?" asked Russ, ever in tune with the world. "No no", said the engineer, who then went on to explain that the Cutty Sark was a famous clipper ship involved in the China trade in the 19th century. The Cutty Sark could attain amazing speeds in excess of 22 knots with only an 18 knot wind. How? Clipper Ships had long narrow hulls and their speed was a result of, among other things, the ratio of the frontal area and rear area of the ship vs the length of the ship and the way this shape/length proportion would allow the ship to slip through the water with less drag. For the same reason our 32 foot fifthwheel often gets better mileage than our 30 foot model, and motorhome owners are often surprised to find they get better gas mileage towing a boat or Jeep than when they don’t tow anything at all. As an example of the kind of mileage our customers have been getting, Jim and Gwen Ulrey have been averaging over 12 mpg while towing a GS 32RK triple slide with their 1997 Dodge Diesel 4x4, and Bill and Angela Vanderziel have been averaging 11 mpg towing their 34/36 triple slide with their turbo Dodge Diesel dually (duals cost 1 mpg). As an aside, our customers who buy their first fifthwheel often end up wishing they had gotten one a little bigger after they have owned it for a year or so. They find that a little extra closet space would have gone a long way, especially since towing a larger fifthwheel is no harder, and sometimes easier (due to better handling) than its smaller counter part. 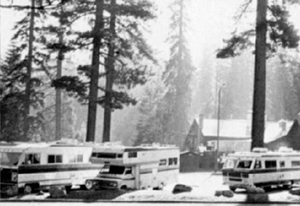 They also learn that their concerns about finding campground space for a larger rig were mostly unfounded with today’s breed of campgrounds geared for accommodating the large number of 40 footers on the road. Now here is a real “kick” and more support for our economy run findings. Here is part of a report just received by email from Don Boyce who lives in Northern Califronia and owns a new GS36/ 37RL triple axle.